The gain efficiency of an amplifier can be defined as the small-signal gain divided by the pump power required to achieve this gain in the steady state. For three-level gain media, it is more sensible to use the differential gain efficiency, i.e. the derivative of the small-signal gain with respect to the pump power. The gain efficiency may also sometimes refer to the stored energy instead of the pump power. where the power amplification factor is exp(g). (For a four-level gain medium, σabs = 0.) This shows that the gain efficiency in terms of stored energy is inversely related to the saturation energy: high laser cross sections lead to a high gain efficiency, but also to a low saturation energy. where ηp is the pump efficiency, including the pump absorption efficiency, the quantum efficiency of the pumping process, and the quantum defect. Psat is the saturation power, which is the saturation energy divided by the upper-state lifetime. Fiber amplifiers with small effective mode area can easily reach differential gain efficiencies of several dB/mW, with special optimization even more than 10 dB/mW. A high gain efficiency can be desirable for an amplifier when a high gain is wanted. 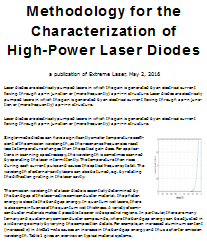 However, it can be preferable to have a not too large gain efficiency in cases where a high energy needs to be stored in a gain medium – for example for Q switching of a laser, or if pulses need to be amplified to high energies. The gain efficiency should not be confused with the power conversion efficiency. For example, an optical amplifier based on a laser crystal may have a low gain efficiency (due to a large mode area) but nevertheless a high power conversion efficiency.